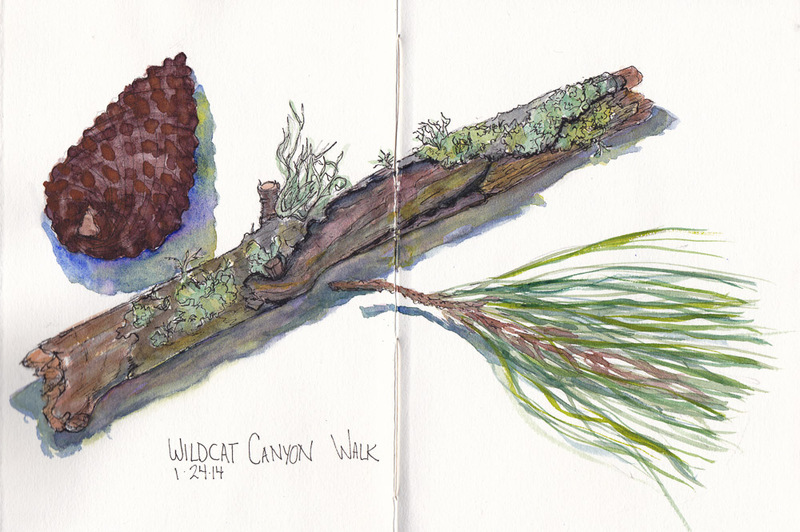 I’ve started collecting items on my daily hikes with my pup to sketch in the studio since I haven’t quite worked out sketching while dog walking yet. Sometimes Millie helps me by carrying the items for me. Once they’re sketched she’s quite happy to shred them into compost for me. I continue to enjoy spending a lot more time outdoors walking than indoors sitting in front of the computer (hence the gaps between posts!). It’s finally started raining in the SF Bay Area but I got some good rain gear so I can even walk in the rain. One of our favorite spots to hike starts at the Alvarado staging area of the Wildcat Canyon Regional Park. It’s so beautiful and quiet up there in the Richmond hills and there are many friendly people and dogs out walking off leash. It’s been such a lovely rain, too. Of course, when old friends come to visit for the first time in a long time they’re so often lovely. May I ask two questions? 1, is who in the generations that preceded us is your favorite, your greatest influence? 2. is which come first: color or outline? Hi Lotus, Thanks for writing and for your questions. The second question is easier to answer than the first since my influences seem to change as time goes by. 1) Some of my favorite artists are Sargent, Sorolla, Rembrandt, Norman Rockwell, Van Gogh, Edward Hopper, Alice Neel. 2) Outline almost always comes first in my sketches. Once in awhile I’ll put down paint first, but that’s rare. Drawing is the number one purpose of my sketchbook. Hi Jana — Thanks for your responses. I see the reason behind knowing your focus that way; it’s a good lesson for me. But first I have to establish one for myself. Which is more important to me (and I think this question contains its answer), the practice of using my hands to make lines, of the finished product. But no, maybe the answer is not so obvious, because for me also it’s about seeing in a particular way…. shadow and light… color…. Well, I’m rambling on, aren’t I? Your artist list is interesting and eclectic! For me, I’d certainly include the first two, and Van Gogh, but I think it would be printmakers and watercolorists that would come first. This week I’ve been studying the flowers of Charles Rennie Mackintosh, and Hannah Overbeck. It’s the lack of the opaque on the paper that I love, when an image rings with light. What a nice life, Jana! Beautiful sketches – reminds me of the photos on stillblog.com. Thanks Jana! You’re so right–it’s a great life and I’m grateful for it every day! Stillblog.com doesn’t seem to be an actual site…it’s a domain name for sale? Oops, it is still blog dot NET! Sorry about messing that up. Very nice sketch of your collection from your walks with Millie. I’m glad to hear it’s finally raining by you. Always enjoy your wonderful watercolor sketches, Jana. Have you thought about creating a small book of proposed walking trails for dog owners, including of course, your beautiful art work?